Peel and half hard boiled eggs. Remove yolks and put in a bowl. Reserve whites to fill later. 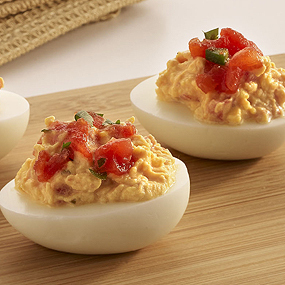 To the yolks, add Furmano's Salsa Style Petite Diced Tomatoes, mayonnaise, mustard and salt. Blend together yolk mixture and place in a ziploc storage bag. Cut off one of the corners and pipe the mixture into the reserved egg whites. Top with remaining Furmano's Salsa Style Petite Diced Tomatoes and chopped cilantro.